Have you noticed uneven tire wear? Or while driving have you noticed: an off-center steering wheel, swaying, drifting or pulling? Is steering difficult? Any of these symptoms may indicate the need for service or repairs to your vehicle’s steering and suspension system. At Haymarket Motors, we have certified technicians who will perform a professional inspection of the system, providing you with a complete analysis of the current conditions and repair cost estimate. 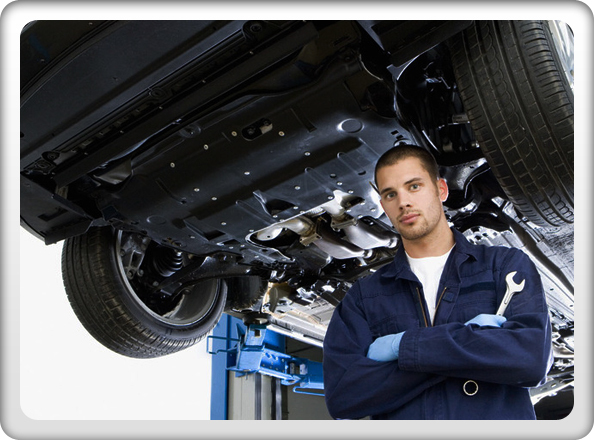 Haymarket Motors is a full-service steering and suspension repair facility. A properly-aligned vehicle can protect you from spending hundreds of dollars in tire replacement and suspension repairs. That’s why we recommend having your vehicle’s alignment checked every 6 months or 6,000 miles. At Haymarket Motors, certified technicians perform alignments using the latest computerized technology for state-of-the-art accuracy. There are two types of alignments performed based on the vehicle’s construction. Your Haymarket Motors service advisor will tell you which one is applicable for your vehicle. For vehicles with adjustable rear suspensions, we adjust the front and rear wheels perfectly parallel to the vehicle’s geometric centerline. The results are four wheels parallel with the steering wheel perfectly centered. For vehicles with non-adjustable rear suspension, we determine the rear wheels’ thrust line (the direction in which they push) and then adjust the front wheels to be perfectly parallel with the rear thrust line. The results are front wheels precisely aligned with the thrust line of the rear wheels, all four wheels parallel and the steering wheel perfectly centered. Worn steering, suspension and drive line components can cause noise, vibration, premature tire wear and misalignment. That’s why we perform a complete steering and suspension system inspection with every alignment. By replacing worn parts you regain steering control and handling, which will return your vehicle to its original operating performance.